The United States of America is perhaps the greatest country in the world today. Even if this statement is still under debate, saying that America is a world super power is not. The president of the United States is seen as the president of the free world. It’s the only country that calls itself God’s own country. It’s no surprise then why millions of people flood the US embassy in a bid to get an American visa. Although America already has a bulging population of over 300 million people, they are still magnanimous enough to open their borders to 50,000 people every year. This number are the lucky few who win green card visas which enables them to live permanently and work in the United States. If you’re reading this article from an underdeveloped or developing nation then we have every reason to believe you must’ve heard about the American visa lottery. Hearing about the American visa lottery is not enough. 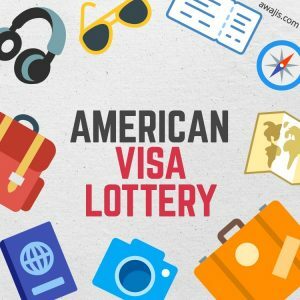 We have prepared this article to tell you seven things you should about America’s visa lottery program. A lot of people rush to the embassy to seek the application form for the American Visa Lottery. This is a good course of action if you live close to the American embassy. However, the only way to apply for the American visa lottery is to visit the official website of the Department of State website and fill out the application form. The form you’ll fill is referred to as Form DS-5501, Electronic Diversity Visa entry Form. This form is made available only during the DV open registration period. The application for the American visa lottery program cannot be gotten the same year it is applied for. The application is done two years in advance. That means if you hope to win the 2019 visa (DV-2019) you must’ve applied in 2017. The application for DV-2020 which is for 2020 was concluded on November 6, 2018. The American visa lottery management uses special technology to identify persons who who make more than one entry. Anyone who makes multiple entries such entries will be found out and automatically disqualified. In fact, no other documentation is required of applicants besides making an online entry. A lot of people get disqualified for something as trivial as applying with an unverifiable address. That’s why it’s very pertinent that when applying for American visa lottery, applicants must use a valid address in this manner: Address Line 1, Address Line 2, City/Town, District/County/Province/State, Postal Code/Zip Code, and Country. Since 2011 it has become mandatory to use a valid email address when applying for American visa lottery. You must provide the email address to which you have direct access. It’s not advisable to provide someone else’s email address or a general company address. The American visa lottery doesn’t discriminate against people who haven’t attained the highest level of education possible. You can apply even if you have just primary school leaving certificate. However, you must indicate on the application form what level of education you and your family have attained. That’s true. For something as trivial as a poorly taken photograph your application could be thrown out. The Department of State website advices that all passport photographs being used must be without headgear, eyeglass and must be taken on a white background. Furthermore, the image must be clear and it mustn’t be a group photo. It’s also necessary that you submit the passport photographs of all your children and step children if you have kids.